Since moving from Boston back to Wellington (or Welly-world as we used to call it when I was growing up) I’ve been enjoying the wonders Mother Nature has to offer during the normally dreary months of winter. The sky is blue, there’s bright green grass, bougainvillea in bloom, and tons of Vitamin D to soak up. I like to spend as much time outside as possible before it gets too hot to handle. There are many ways to be entertained and enjoy the weather in our lovely little town. One outdoor location that I like to take advantage of is the area near Wellington Village Hall. Every Saturday morning there’s a small green market where you can buy fresh fruits, veggies, and flowers. On Thursdays you can attend “Food Truck Invasion” with a variety of 23 food trucks to choose from. Saturday evenings include live outdoor stage performances with artists such as the Journey Tribute Band and No Strings Attached. Who doesn’t love the songs Born to Run, Dancing in the Dark, and Born in the USA? 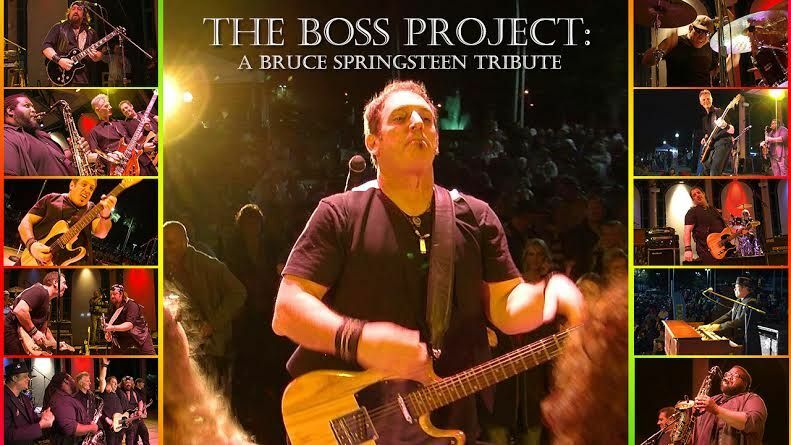 On the evening of March 14, 2015 I attended a concert at the Wellington Amphitheater where I heard the wonderful talents of The BOSS Project: A Bruce Springsteen Tribute. Prior to the concert, I had the pleasure of interviewing Paul Goldschlag (a.k.a. Bruce), the lead singer of The BOSS Project. He had the spirit of Springsteen himself and just as much talent and charisma. Rachel Baumel (RB): Tell me what you, personally, find most exciting about performing live? Paul Goldschlag (PG): From time to time in life, in those quiet moments, I believe we all wonder what it is we “do” that benefits the world we live in. Sometimes, we get to make that an exciting experience. For me, it’s putting a smile on the faces of those in the audience when we take to the stage and perform. For the audience, it’s a moment. It is for those who are remembering a special time in their lives that is brought forward by the music or a lyric captured live in concert. They say music touches the soul and I’m just the messenger for Bruce Springsteen’s music. But, once in a while, even the messenger gets excited by that touch. That moment is what I find most exciting about performing live. RB: Tell me about the origins of The BOSS Project? PG: Cary Stadtlander, the drummer for The BOSS Project, and I have been best of friends for over 20 years. 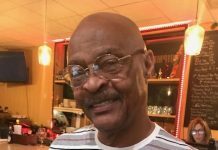 He and I were in a cover band called Amp’d with some truly great and talented musicians, playing the local South Florida club and bar scene for years. We were discussing the business of music with our then guitarist, the very talented Randy Lavenia, who also happens to be a Wellington resident. We decided to step it up a few notches and take on a Bruce Springsteen tribute. Not an easy task by any stretch! After a band meeting [which included] lousy Mexican food and cold beer, it was in the works. “Bruce fans, here we come!” was our battle cry! After putting in many months in the studio and going through several different musicians and many auditions, it came to fruition. There was such [a strong] desire for a Springsteen tribute like ours, that we were booked out several months in advance before we even stepped one foot on stage. We had a LOT of help from wonderful and talented people. The list is WAY too long to mention all of their names, but they know who they are and we thank them profusely. It wasn’t a bed of roses. We had gotten [involved] with a rather nefarious character parading around as a “talent agent” who stole a lot of money from us. You live; you learn and never stop learning – especially in the music business. We now have a couple of agents [that] we work with, but I would be remiss if I didn’t mention the great job done by Rich Rubin and his staff at Maximum Bands. RB: Have you ever met our Wellington neighbor, Bruce Springsteen? If so, has he heard you perform? PG: No, but we made a pretty good splash playing here last February and we are hoping he has heard of us. 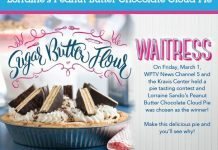 If he’s in town, we’re hoping he or someone in his camp make an appearance… BRUCE: if you (or anyone who knows you) are reading this, please come on out and hear us – and have some fun with your fans in Wellington! PG: Let’s not get carried away. I’m no Bruce Springsteen. I’m not an impersonator. 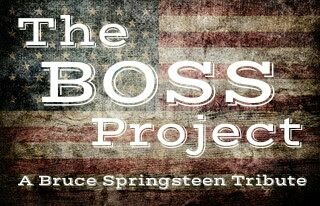 The BOSS Project: A Bruce Springsteen Tribute is a seven-piece ensemble of some of the most talented musicians I’ve ever had the pleasure of working with. [We] pay tribute to arguably one of the most prolific songwriters/performers of our time, period. RB: So, tell me about the band? The musicianship required to pay tribute to “The Boss” is extreme and I am truly in awe of the members who make up [the band]… from the guitar wizardry of Freight Train Kane to the brilliance on keyboards by Cary Keyz. [We also have] the spiritual Hammond B3 organ playing of Muggie Doo, the energetic bass guitar of Thomas Larkin and the aformentioned stewardship drumming of Cary Stadtlander. No Springsteen and E Street Band tribute could be complete without a big man on sax. 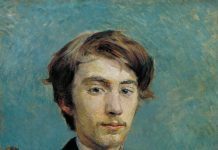 We have the greatest, John Harden! This is arguably one of the most talented groups of musicians around. RB: Can you tell me a little about yourself? RB: In your own words, how does Bruce Springsteen inspire you? PG: [He is] “anthemic,” electrifying, emotional, exciting and brilliant. However, more than anything, having seen Bruce Springsteen live in concert several times, the most inspirational attribute of Bruce Springsteen and The E Street Band is the energy he and his band exude during a live performance. It is an AMAZING accomplishment and something any musician or music fan should bare witness to. Honestly, I wasn’t a huge Bruce fan until I saw him live in concert. Truly spectacular! It is that very thing – the live performance – The BOSS Project tries to emulate. We push and push until the tank is empty, night after night. RB: What is the age range of most of the musician members in your band? PG: The age range of our seven members is from early 30’s to early 50’s. RB: What percentage of your audience are between the ages of 18 -35? PG: Difficult to tell, but I will say that it always surprises me, as to how many in that age range show up and sing along to every word of each song we play. I’ve been known to bring some of them up on stage and sing with us during our shows. It’s all about having fun and enjoying the incredible music of Bruce Springsteen. Previous articleApril, 2015 – What Does Earth Day Mean to You?